There are a few ways to think of data set extremes. The most obvious seems to be actually looking at the outliers of a data set. Whether you have a little or a lot of data, chances are there will be some data points that aren’t nicely lined up with everything else. You may have one big cluster and then a few others that throw everything off, including scale. It’s important to consider those outliers when thinking about your design or chosen visualization. How will you handle them? Will you not include them in some views, but have other views where they can be seen? Another important part of data extremes are the amount of granularity in your data and what you actually want to show. If showing an amount of time all the way down to the seconds is available, ask yourself if it’s really valuable for your purposes before including it. Also look at the length of time over which your data expands and how you choose to show that. If you show data from a long period of time in a small amount of space, the amount of granularity that someone will be able to see may be minimal. Comparisons are also quite important. If you have two charts that are being compared, but the minimum and maximum numbers are quite different, scaling the axis’ appropriately so they can be accurately compared is vital for quick and easy comparison. If the axis’ are not to scale comparatively, people may actually misread the data at first glance. Other types of extremes to consider are text based extremes. If you have some lists that will be really long and others that will be short, how should you handle that? Word labels will vary in size and you may have some that are really long. Think about the approach to that. Should you show part of the label and have the full label show upon rollover? Or should you have the label jump to two or three lines, if necessary? Is there a better solution? Each scenario is different, so think about what works for what you are doing. Also, be sure to account for perceived color differences if you are choosing colors to represent your data. The more categories you have, the more tricky this can become. If you think two colors may be a little close, find different colors. You may know that they are different, but others may not seen those differences if they aren’t pronounced enough. This Network of Data Visualization references does indeed have lots of useful information; however, the enormity of the data in combination with a network diagram leads to your classic hairball example of mismatched design and purpose. There is an attempt to remedy this with a fisheye interaction, but it manages to both not solve the problem and add difficulty actually making selection. Gapminder World examples one good consideration to deal with its extremes by presenting an optional toggle directly on the axis to switch between a linear and logarithmic scale. More often than not, dashboards get lit up with color like an over-dressed Christmas tree. The color is applied indiscriminately and adds little to the meaning of the dashboard. Appropriate use of color requires restraint. In our dashboard designs, we typically start by using only grey, then we gradually add color where it conveys useful information. Color can draw your eye to what is important and tie together similar things. For example, if we increase color brightness, it will attract attention and make a point seem more important. Similarly, use of the same color hue can be used to connect things that are related. Color can communicate emotion and feeling. For example, red can be associated with positive feelings like excitement and desire, but also with negative feelings of danger and alarm. One common use for color in data visualization is using red for negative/loss (like a loss of money) and green for positive/gains. If you were to have a green arrow pointing down to show loss and a red arrow pointing up to show gains, that would be confusing. The meaning of color differs by culture. For example, in the U.S., white is the color worn by brides to symbolize purity. In China, white symbolizes mourning and death, and red is the color for brides and celebration. Colors can be broken into high-level dichotomies such as “earth-tones” versus “unnatural” colors. 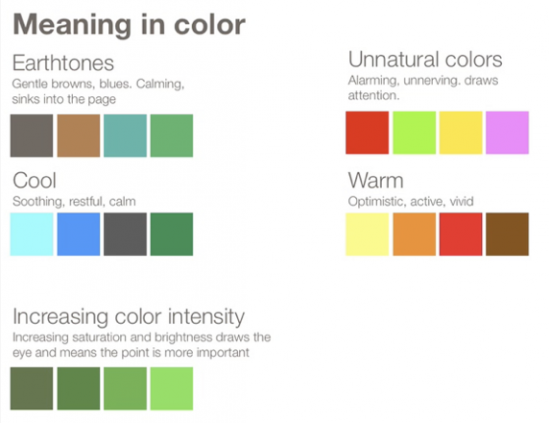 We perceive earth-tones as calming (Edward Tufte has said that these are the kinds of colors you want to use if you just want to use color very gently on your page). In contrast, unnatural colors jump out at your audience, making them ideal for showing an alert. Sequential when you are ordering values from low to high. Divergent when the values are ordered and there is a critical mid-point (e.g. an average or zero). Categorical when data falls into distinct groups (e.g. countries) and therefore requires contrast between adjacent colors. Poor usage: With red being such a bright, powerful color that can create strong positive feelings of passion and desire or strong negative feelings of alert or alarm, it is generally a color used more sparingly. The use of red here doesn’t really support the content and its overuse becomes overwhelming to look at for long periods. Also, color should be used to highlight things or separate sections of information. Because the red is so prevalent and bright, it becomes unclear where to start when you first look at the page. Good usage: Mint.com’s mobile application uses red to alert overspending or a loss, green to show good money usage or a gain, and yellow to warn that you are getting close to overspending. Generally, limit your interface to 2 emphasis colors to direct the eye. Use grey values for structural elements to define space and establish rhythm on the grid. Didn’t your momma always tell you to limit your colors? Well, she should have. Here’s why. We naturally make visual associations between things of the same color. Our brain naturally says, “Color has meaning. Perhaps these things of similar color are grouped somehow.” The problem is when you start adding useless colors to an interface, this muddies our natural ability to see color correlations. Usually, these tie-dye interfaces appear from the infamous effort to “spice things up” or “make it pop.” The intentions are innocent, but the resulting colors get in the way of clear decision making. We want to reserve emphasis color to draw the eye to the most important things on a page. Good design is the culmination of many small decisions composed into clear and purposeful communication. Use colors to purposefully move people through a work flow while drawing their attention to information they care most about. If there is a large amount of instruction that needs to be given, there are a couple ways of achieving this. One is the fairly common use of a “Help” or “?” button. Users can click on these buttons only if and when they need help. Sometimes a button like this may even be sprinkled throughout an application next to the thing it is explaining. The benefit of this method of instruction is that it is unobtrusive to someone who is already familiar with the application and how to use it, but it is also easily accessible to someone who is unfamiliar. Another way of communicating a large amount of instruction, such as a quick overview of how to use an application, is to have tutorial based instructions. This could be through the use of a video that plays the first time a user enters the application, or through the use of text boxes that pop up and guide the user as they use the application so that instructions are given within context. However, if a method of instruction such as this is used, it should only be used upon first visit otherwise it becomes very intrusive. There should also be a way for the user to exit the tutorial instructions if they no longer need them and return at will. If you are trying to convey a small amount of instruction such as what an icon or button is for, a “Help” button that takes you to a different page or section or a video tutorial is not going to be necessary. In that case, a tooltip that brings up a few words of instruction would probably suffice. This method is very common and useful. It’s simple, yet informative and it is unobtrusive to someone who is familiar with the application and doesn’t need instruction. There are times when instructions can also be written and on screen at all times. The use of this should be very limited though. You don’t want to clutter the application up with unnecessary text. An example of when to use written instructions would be something like in the image below (to the right of each input area). If there are input text fields and people need guidance and/or direction as to how things needs to be formatted and what they are needed for, those can be permanently on the screen if necessary. If the instructions you are providing will need to be referenced often, first ask yourself if there is a better way to design what you are asking people to do. If the way to use something can’t easily be remembered or understood after using it once or twice, there could be a problem with the design. If it’s not a problem with design and it’s information that may need to be referenced often, it’s best for it to be easy to get to and have small amounts of text. That type of information can be in hover over text boxes or popup text boxes. If it’s instruction that will only need to be accessed occasionally or only by some people, the “Help” section would probably be the best place for it so that it is out of way but still easy to find. Avery printing template software – Having just selected a template, there is literally no indication as to how return to pick a different one. First activation of the task bar seamlessly explains is purpose. A temporarily empty view is prime real estate for invitational instruction. Google iphone app – Direct overlays for global interface instruction are lightweight and intuitive. 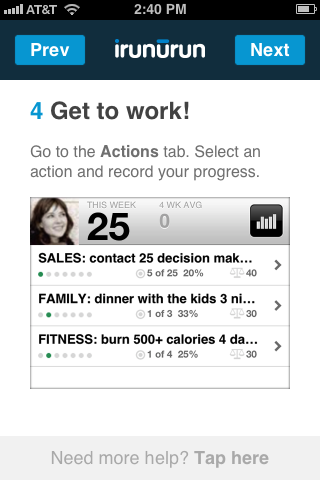 IRUNRUN iphone app – Walkthroughs are good for custom, directed introductons to set your mind right. Could my application be improved by implementing this principle?Should I improve this aspect of my data presentation? It's not easy to think like a designer, but behind these fundamentals is a wealth of potential for you and your business. Even though this is a work in progress, our thinking is to go ahead and put the list out there to show the breadth of where we're going. Let us know what principle name you'd like to see next by adding a comment below!